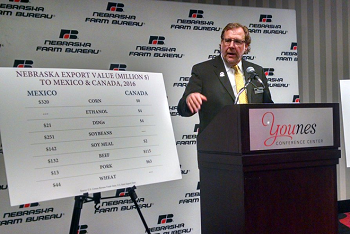 Nebraska Farm Bureau senior economist Jay Rempe discusses the NAFTA report at the group�s annual meeting in Kearney. A new report from Nebraska Farm Bureau shows the impact that a NAFTA withdrawal could have on the state's ag industry. The report examines the per farm/ranch, and per county implications of NAFTA, as well as examining the value of NAFTA on a commodity-by-commodity basis for each Nebraska county. "We've examined NAFTA's importance for every county in the state and there's some interesting findings," says Nebraska Farm Bureau economist Jay Rempe. "We estimate the value of agriculture exports under NAFTA from Platte County tops $34.5 million, making it the highest dollar export value county in the state. On a related front, the report shows that Phelps County has the most at stake in NAFTA on a per farm/ranch basis as the trade agreement is estimated to be worth $55,468 to the average agriculture operation in that county." According to president Steve Nelson, the report's finding paints a very clear picture of where the Trump Administration needs to be on NAFTA. "While we understand the President wants to get the best trade deal possible, the idea of withdrawing from NAFTA is unfathomable. That would be a disaster for Nebraska and American agriculture," Nelson says. "The same could be said of any renegotiations that would weaken agriculture's trade position in the agreement. Farm and ranch families are already working through a struggling agriculture economy and the loss of NAFTA would undercut recovery and more importantly cause long-term damage well into the future." The "North American Free Trade Agreement and Nebraska Agriculture" report containing the full economic analysis is available on the Nebraska Farm Bureau website at www.nefb.org.